I am a previous hair transplant patient who has class VI hair loss. I had previous procedures done to get some thin hair in the front and top. I am keeping my hair very short on the back and my primary goal was to camouflage the scar in the back of my head from previous hair transplants. So far, I have achieved this by simply growing my hair longer, and covered the rest of my scalp with Toppik-like products. Cosmetically, the hair restoration was successful, but constant usage of this kind of product is a bit messy and annoying. Because of this, I have completely shaved my head and decided to try a different route. With the help of tattooing, I was going to go for a shaved head look. Unfortunately though, the scar is a show-stopper and I need to consider all of my options. What I would consider to be a successful result is: short hair completely covering my head (even if only relatively light density) combined with tattooing and a self-tanner to reduce contrast. I am not “greedy” about the sides at the front, and will accept a 3 or 3A pattern. Is this possible in my case, though? It is good to hear that you are not striving for high density and that you are realistic about the final appearance of your hair. Being a class VI with limited donor hair, should leave options open to create light density in your large balding area, but obtaining more density would be extremely difficult if not impossible due to your insufficient donor hair. You should know your priorities and how many surgeries you are committed to have in order to achieve your desired look. If you only need to revise the scar and have trichophytic closure done to minimize the visibility of your scar, one surgery is adequate. Double edged trichophytic closure is a new technique that can improve the appearance of the scar tremendosly. If you are attempting to achieve higher density as well as scar revision, you may need several hair transplant procedures (depending on your donor amount available). Your donor hair can be easily evaluated and options can be given to you for about what to be expected through attending a consultation with an experienced hair transplant doctor. Recently, Dr. Parsa Mohebi, Medical Director of US Hair Restoration Los Angeles, gave a lecture on a new way to use the Laxometer during mega and giga-session hair transplants at the annual ISHRS (International Society of Hair Restoration Surgery) gathering in Amsterdam, Netherlands. As mentioned in other hair transplant industry gatherings, the Laxometer has the ability to make more accurate the strip removal method during a follicular unit hair transplant and, at the same time, minimizing the risk of donor scar complications. At the 2009 ISHRS Meeting, Dr. Mohebi discussed a new manner in which to utilize the Laxometer for patients who have limited laxity of the scalp because of previous hair transplant surgeries or for people needing a max number of grafts in one session (3000+, 4000+, 5000+, etc.). In 2008, Dr. Mohebi tried a different method by which he removed the strip in sequences for hair restoration procedures using the Laxometer before and after removal of every part of the strip. 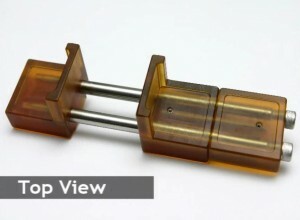 This particular way of using the Laxometer has resulted in a safer strip removal and, at the same time, has lessened the risk of donor wound complications. The findings revealed at the ISHRS meeting proved that the Laxometer is the ideal surgical tool for increasing the number of hair grafts during a strip hair transplant while minimizing donor wound complications of a hair transplant surgery. Because of the results Dr. Mohebi found, he has been using the Laxometer at his California hair transplant offices quite often and it has resulted in a lot of satisfied patients. There are a couple of techniques that can be used to correct this issue. The most common is a simple excision and closure of the scar which may reduce the scar’s width. Considering the scar is behind the neck area, BOTOX can be applied to prevent future stretching. Some patients may require what is known as trichophytic closure which allows hair to grow into the scar further minimizing the appearance of the scar. Finally, the most effective way of eliminating scar visibility is by means of an FUE (follicular unit extraction) procedure to fill in the scar left behind by the strip procedure. The maturation or completely healing of a scar is a timely occurrence. Scars can sometimes take as long as 6 months to fully develop and can continue to evolve even after that time but at a slower rate. Because of how long scars can take to fully develop, we avoid during any type of scar revision surgery until at least 6 months after wound closure. 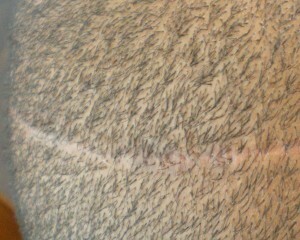 We offer free donor scar revision consultation at our Orange County hair restoration office. Hair restoration surgery through follicular unit transplantation is the golden standard for hair transplants to date. This procedure is designed to fully recreate a natural looking hairline and add density or restore lost hair caused by male or female pattern baldness. The only concerning factor of this technique is the scar that remains after the procedure is complete. Men especially whom have had hair restoration surgery have wondered and asked how short can their hair really be to avoid seeing or even noticing the scar and if there is a way to avoid such a scar? 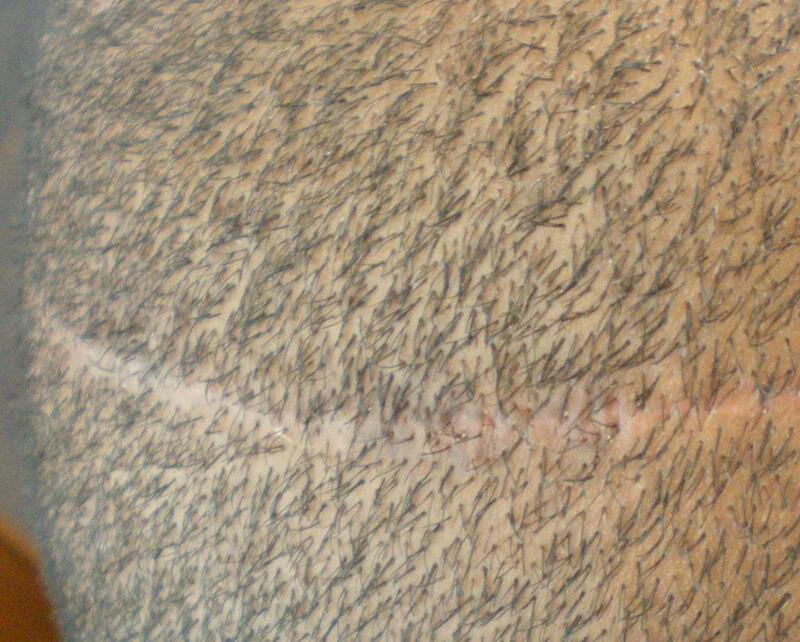 The linear scar that is left after a hair restoration procedure through strip technique is really inevitable but can be made less visible depending on your hair transplant surgeon. Most facilities that do hair transplant practice a technique known as trichophytic closure for their patients. Trichophytic closure is a technique used where hair follicles will penetrate through the donor scar which, in turn, minimizes its visibility and detect ability. This can be compromised if the scar ends up stretching or widening. Another study conducted has shown that BOTOX can be used to prevent further stretching or widening of the donor scar and must be applied by a professional physician for best results. The length of a person’s hair is really up to the patient or their stylist’s best disclosure. Most donor scars are minimal and undetectable but in most cases anything shorter than a #2 clipper (1/4″ buzz cut) may make the scar visible. The only other option available to minimize scarring is through a different hair transplant technique called follicular unit extraction (FUE). This technique is done by selectively extracting follicular units and refining them for hair transplantation. The result is undetectable and the downtime is even less than that of follicular unit transplantation through strip technique. This procedure can also be used to fill in existing scars where hair use to grow or the donor scar area. Findings on this type of procedure were originally published when conducted on patients with neurological scar revision.